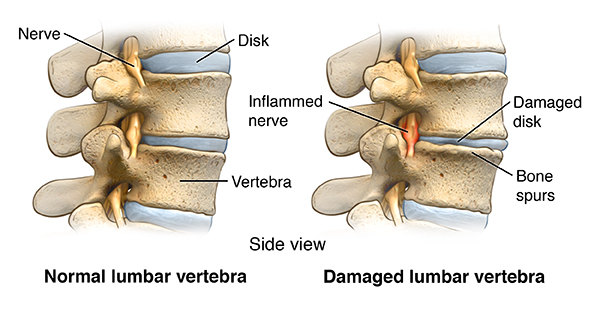 A lumbar disk replacement is a type of back or spine surgery. Your spine is made up of bones called vertebrae that are stacked on top of each other. Disks between the vertebrae work like cushions. They allow the vertebrae to rotate and move without the bones rubbing against each other. The lumbar vertebrae and disks are at the bottom of your spine. 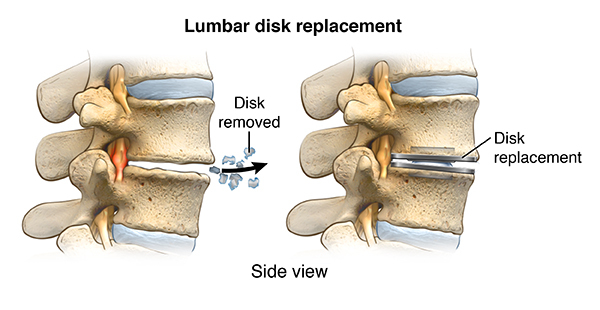 Lumbar disk replacement involves replacing a worn or degenerated disk in the lower part of your spine with an artificial disk made of metal or a combination of metal and plastic. Lumbar disk replacement is often seen as an alternative to the more common spinal fusion surgery. Fusion permanently joins 2 vertebrae together. Lumbar disk replacement is a major surgery. It requires general anesthesia and a hospital stay. The main reason you would need a lumbar disk replacement is to treat low back pain. Still, not everyone with low back pain is a good candidate for this surgery. Your healthcare provider will need to do some tests to see if it’s right for you. Your back pain mostly comes from only 1 or 2 disks in your lower spine. You have no major joint disease or compression on the nerves of your spine. You are not too much overweight. You haven’t had spinal surgery before. You don’t have scoliosis or some other spinal deformity. There may be other risks, depending on your specific health problem. Understand the risks and benefits of lumbar disk replacement. Also discuss any concerns with your surgeon before the procedure. Along with a physical exam and health history, you may need X-rays, an MRI or CT scan, and blood tests. These help the healthcare provider identify the true nature and extent of your back pain and spinal damage. They may also be needed to get a better view of the spine and decide whether the surgery is right for you. Tell your healthcare provider about all medicines you are taking. This includes prescription and over-the-counter medicines and any vitamins, herbs, and supplements. Some of these may affect things like healing and blood clotting. So you may need to stop taking them before the procedure. Talk with your healthcare provider so you know exactly what you need to do before your procedure. You will have an IV line put into a vein in your hand or arm through which an anesthetic is given. The medicine will put you into a deep sleep. It will keep you from feeling pain during the surgery. You will be lying on your back for this surgery. You will be taken to a recovery area for close monitoring until you are awake from the anesthesia. You will still have an IV line. You may also have a catheter in your bladder to make urination easier. When you are fully awake and alert, you will be taken to your hospital room. You will probably need to stay in the hospital for a few days after your surgery. Because a lumbar disk replacement doesn’t require bone to heal, the recovery period may be faster than with other back surgeries. You’ll be given pain medicines if you need them. You may be encouraged to stand and walk within the first day after surgery. Your IV and bladder catheter will be removed within a few days of surgery. You will be shown how to move properly and how to do exercises, such as gentle trunk twists. This will keep your spine limber. It will also help you have a quicker rehabilitation and recovery. As your recovery progresses, you’ll be encouraged to walk and stretch. You’ll need to avoid any jarring activities or motions for quite a while. Your recovery may take from a few weeks to a few months.